Kathie Hill presents a "buffet" of her best non-seasonal songs in The Best of Kathie Hill's All-Year-Long Songs. These 14 songs include a tempting variety of styles, difficulty levels and themes that makes this collection perfect for worship leading, almost any children's activity, and for sharing the excitement of your kid's choir program "between" musicals. Kids will enjoy favorites like "The Perfect Ten," "Input Output" and "The Sign of Christ." Directors will sink their teeth into the blend of contemporary songs, hymn arrangements and worship choruses, while teachers will devour the free downloadable teaching activities for each song. 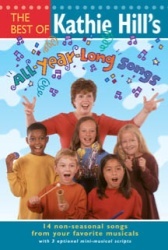 And just as a good smorgasbord ends with dessert, The Best of Kathie Hill's All-Year-Long Songs concludes with three optional scripts which combine songs from the collection to create "sweet" mini-musicals on God's faithfulness, the character and names of Jesus, and the life changing power of Christ. Like The Best of Kathie Hill's Christmas, The Best of Kathie Hill's All-Year-Long Songs is a must for your music library.